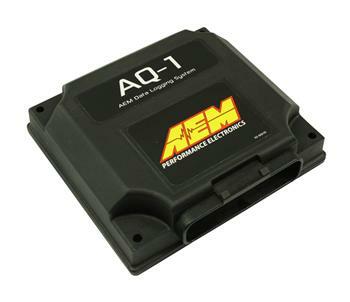 The AQ-1 Data Logger records and stores vehicle data so that it can be downloaded and analyzed. Knowledge is power, and the information stored in the AQ-1 Data Logger can help users improve a vehicle’s tuning and set up, and their own driving ability. It is ideal for all types of racing and street performance enthusiast vehicles. AEM’s AQ-1 Data Logger is easy to use, feature packed, and it won’t break the bank with an estimated street price of $349 with harnesses sold serpeately. With logging rates of up to 1000HZ (1000 samples/second) per channel, the system is one of the fastest on the market, and with 2GB of logging memory standard it’s also one of the largest. Additionally it features an internal 3-axis accelerometer, a removable SD card for virtually unlimited logging (up to 32GB at a time), and includes an available RS-232 serial input for adding an NMEA GPS device. AEM’s high-quality, color-coded 18” flying lead wiring harness for the AQ-1 data logger includes everything you need to properly wire your vehicle in one easy-to-follow configuration. We silk screen each individual wire function onto the body of the wire to ease the installation process and reduce any chance of misidentifying a wire during set-up.